We have helped hundreds of clients, but don’t take our word for it. See what our customers are saying about our services! Revital Credit Services was an incredible help. We found ourselves in a family medical situation where we needed a larger home unexpectedly and immediately. We were not prepared to move to a larger home. We were overwhelmed when we were introduced to Jeff and his team. Within a few weeks they were able to guide us through the necessary steps. This allowed us to buy a larger 4 bedroom home in a prominent subdivision. They worked with us, guiding us each step of the way. Before we knew it, we were signing our closing papers on our new home. Thank you so much! We never thought we would be home owners but your company made our dreams come true. I was fresh out of a divorce and needed to find a place to live. What to do? I requested help from Revital Credit Servies. They were fast, friendly, and compassionate. They got to work quickly. Now, I am actually buying a house! I would, and have, recommended him to my friends and family. It was easier than I thought it would be with the right help! Thanks, Revital! I wanted to provide you with some feedback regarding my experience with Revital Credit Services. I’ll recommend Revital Credit Services to any friends who are buying a home. Everyone’s professionalism helped my transaction proceed smoothly and without any delays. I deeply appreciate the constant attention I received from Revital's thoughtful advice, and perseverance through it all. Thank you for helping me get into this wonderful home This was an amazing team I had the privilege to work with. Your service was great. I’ve been so happy about it that we’ve been bragging about all of you. You are all heaven sent!!!!! Even though I never met a representative face to face, I can truly say they were most attentive, easy to deal with, patient, and reliable. Their emails were not judgmental. They are very precise with the information they request, and with the feedback they deliver. If you do what they suggest, you will meet your target date. I will highly recommend others to Revital Credit Services. Thank you. Revital Credit Services is a corner stone in my real estate business. They treat my clients with compassion, respect and understanding. They attack the credit concerns providing a step by step program to be followed with a specific graduation date and keeps me updated throughout the process so I know how to best serve my home buyer clients while in his program. All 11 clients I have referred to him in the last year, have found themselves homeowners in 3 to 9 months and simply raved about their experience with Revital Credit Services. I am so proud to have a colleague I can count on to provide professional assistance to my clients. They have never been a disappointment in the five years I have known them. There are times when we need guidance and a helping hand to point us in the right direction to achieve our goals. Jeff and Michelle with Revital Credit Services play an instrumental part in helping my clients become ready to fulfill their dream of purchasing a home. They are a very important part of my business and are part of the tools that I offer my client to find solutions to their problems to win at home buying. The benefit and support that Revital Credit Service adds to my business is immeasurable. Every closed home buyer customer I've had sings their praises and is so happy they signed up, not to mention the price for all that they do is extremely reasonable. My Realtor partners are beginning to offer them as a preferred partner as well. I could not be as productive without them! I have been using the team with Revital Credit Services for about 5 1/2 years now and they have helped me assist countless home buyers achieve the dream of Home Ownership. Most of these clients never thought they could own a home. The knowledge that Revital Credit Services provides and their communication with me and my clients has proven to be instrumental in the approval process. I highly recommend Revital Credit Services to anyone who personally or professionally can benefit from this company. 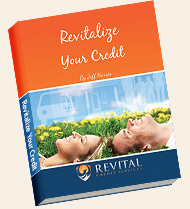 I have referred my clients to Jeff with Revital Credit Services for over 5 years. He has always been prompt and thorough in explaining the necessary steps. His strong knowledge base has been instrumental in helping home buyers navigate the bumpy and ever changing road of the mortgage process. Those that chose to follow Jeff’s plan have a high success rate of purchasing a home upon completion of his program. Jeff keeps me and the real estate agent in the loop during the process so the home buying process is seamless after graduation. I’ve sent Jeff with Revital Credit Services hundreds of clients over the years and he has turned so many of those clients into homeowners. The approach he takes by providing a proposal of the things needed to be done, which really helps my clients feel comfortable working with him. I’m happy to say that I’ll continue referring business to Jeff and his team. Jeff Harris and his team at Revital Credit Services have been paramount in the success of my business. A large majority of my referrals are first time home buyers. Jeff has worked with numerous clients who otherwise thought they could never purchase a new home. He and his team at Revital Credit are quick and efficient. At a recent closing, the borrower was overjoyed and in tears at the fact that he was now a homeowner and attributed it to Jeff, who helped making getting a mortgage a reality. In my mind the service that Jeff and his team provide is priceless. Jeff and his team with Revital Credit are amazing. The program not only helps buyers qualify but it also takes already qualified buyers to a better position and helps them save in rate. This program is an amazing tool for Realtors, home buyers, and Loan Officers! Revital Credit Services amazing! Jeff and his team are very quick to respond to me and all of my customers every time I send them a referral. I love getting the chance to get my customers excited again about becoming a homeowner. Jeff just got one of my client's, and we closed on her home this week. She is a single mother and is by far the most appreciative borrower I have ever had. She firmly believes that Jeff and I made her dreams come true. Keep up the good work, you are making many people's dreams of home ownership come true! I have been in the loan business for almost 20 years. Revital Credit Services is a company that I trust. They are honest, they communicate well with all parties, and they are down to earth with clients. I love their updates and their congratulations when clients graduate their program! They help people, and they deliver what they promise in the time frame that they forecast. I consider their representatives an important part of my team. I highly recommend their services. Thank you for all your assistance with my clients. I have worked with you for at least 8 years and continue to be pleased with your hard work to help buyers accomplish the goal of home ownership. My clients are always pleased, and tell me you made an embarrassing situation workable. They tell me that, in the past, they were harassed to the point they could not complete the process. I feel your experience and knowledge sets you a part from other industry experts. Your passion to help buyers that do what you advise them to do is one of the reasons I continue to send my buyers to you.